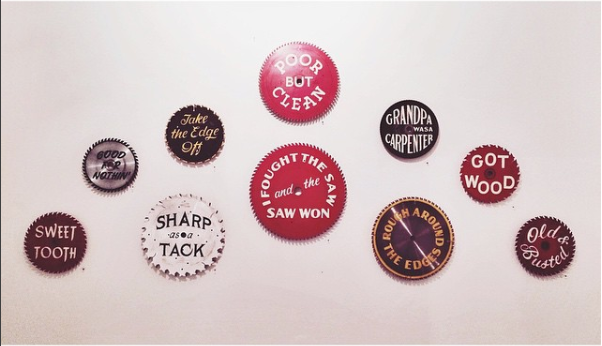 Joe Swec is a prolific, locally-loved sign painter and designer. The signs and murals he paints for Austin businesses have shaped the vibrant identities of the city’s various neighborhoods. 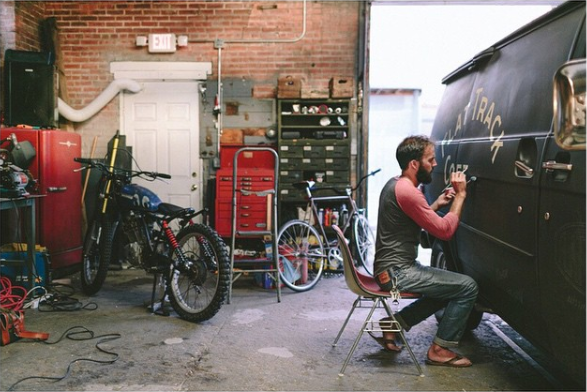 From sawblades to cement floors and truck doors, Joe has handpainted it all. 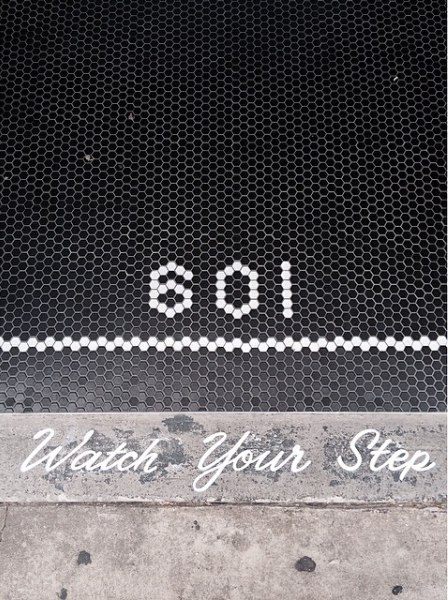 While in Austin for SXSW, our team spent some time with Joe, touring the city to see his work while getting to know the man behind so much of Austin’s eclectic signage. Austin is big on live music— It’s a huge part of our culture as a city. This is a mural I painted for a downtown music venue that ended up closing. A new business took over they building and they wanted to honor the music venue with a mural. Jackie Oakley designed the faces, Simon Walker designed the type, and I painted the mural. 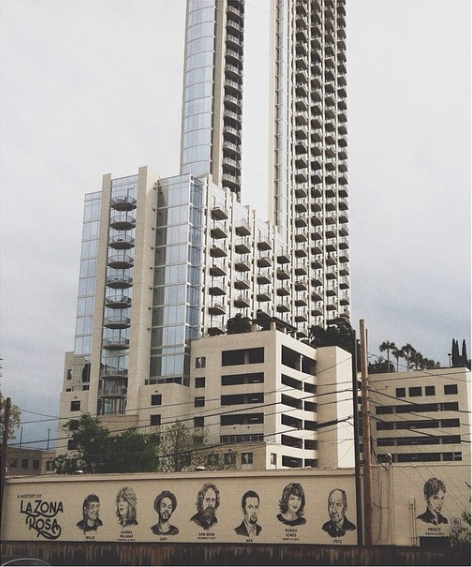 It’s about 100 feet long with huge five foot tall faces of famous people who have played there. It was a fun project because of the historic context. Painting a landmark like this was really gratifying because I was conscious that I was painting something meant to be remembered for years to come. 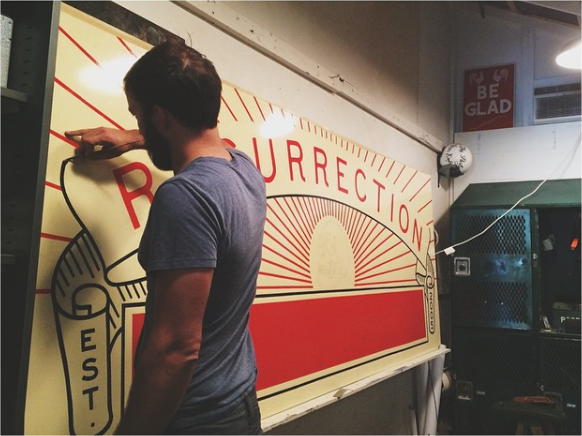 This one is always a sentimental job for me because it was my first one as a professional, full-time sign painter. They let me paint everything in that whole place. If you walk into the restaurant everything is handprinted. You wouldn’t assume it’s hand painted but now I’ve shared that you will. This is an ongoing art project I’ve been working on over the last couple of years. 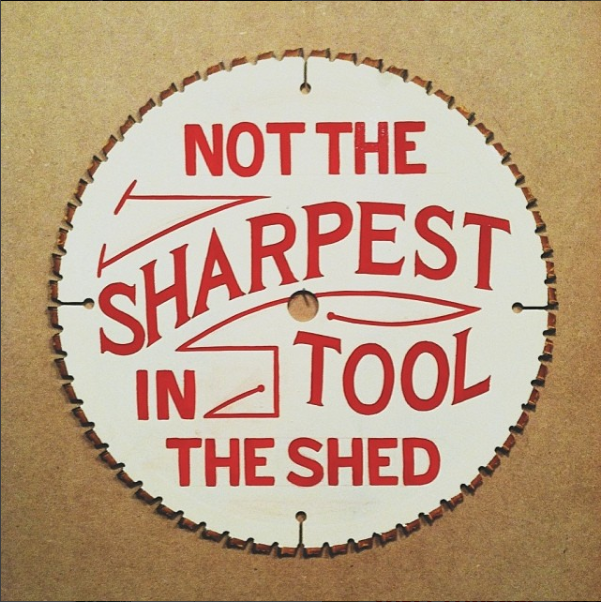 So many of my friends around here are woodworkers and they give me their old circular saws when they’re done with them. I’ve painted dozens of these with funny phrases, either making fun of myself or making fun of them. I like this sign because it shows how much of what I paint goes unnoticed. It’s a painting on a curb in front of a restaurant. You’d step on it and never notice— Well, hopefully you’d notice so you wouldn’t trip, but you wouldn’t look at it and think, Look at that, it’s handpainted! or wonder who painted it. So often, people walk up to me while I’m painting something to tell me they didn’t realize people hand painted signs like that. I hear that all the time, and it’s something I really like about my job. Some signs are not meant to be noticed, but deep down even the signs that don’t get noticed as much have a better aesthetic quality when they’re handpainted. I just really like the design of this one. It features beautiful, elegant lettering designed by my friend Paul Fucik. These are the lettering jobs I get really excited about because they are so well put together. 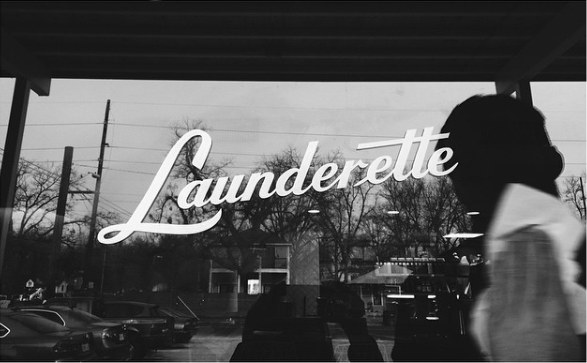 I design lettering about half of the time, but I also collaborate with friends who are designers. Honestly, I’d rather be doing the painting! I really love the idea of the old, painted work truck. 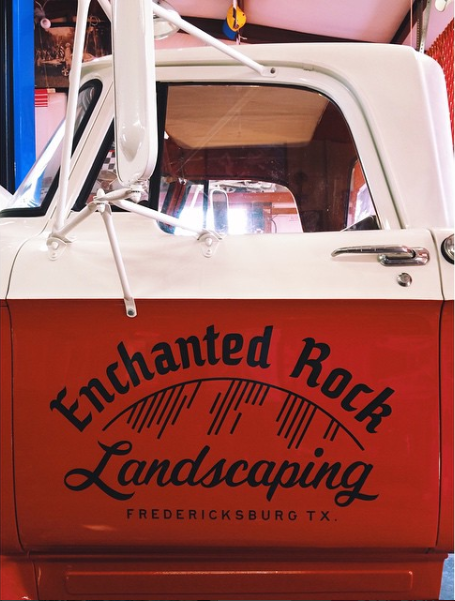 There were so many great trucks handpainted with company logos back in the day— Every construction company, carpenter and landscaper would hire a sign painter to custom paint their truck. Getting the chance to paint someone’s truck like that doesn’t happen often anymore. This one out in Fredricksburg, outside of Austin, really lends itself to the tradition of the craft. 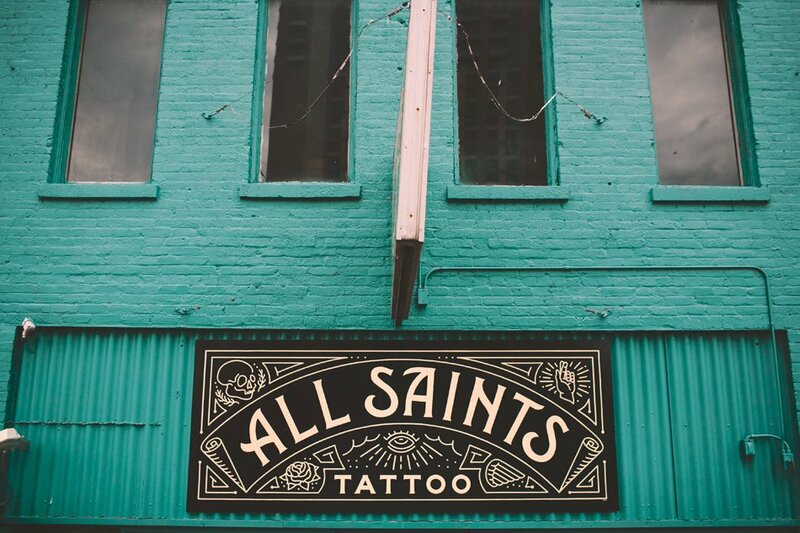 Tattoo companies always have their signs handprinted— it’s a thing. This was my take on a sign for a tattoo parlor. Neon signs are pretty big in Austin, and this shop had a big neon lightbox set up for this sign. It’s aluminum, so I drilled holes through in the outline of each letter, and when the neon box is lit up it shines through the holes. 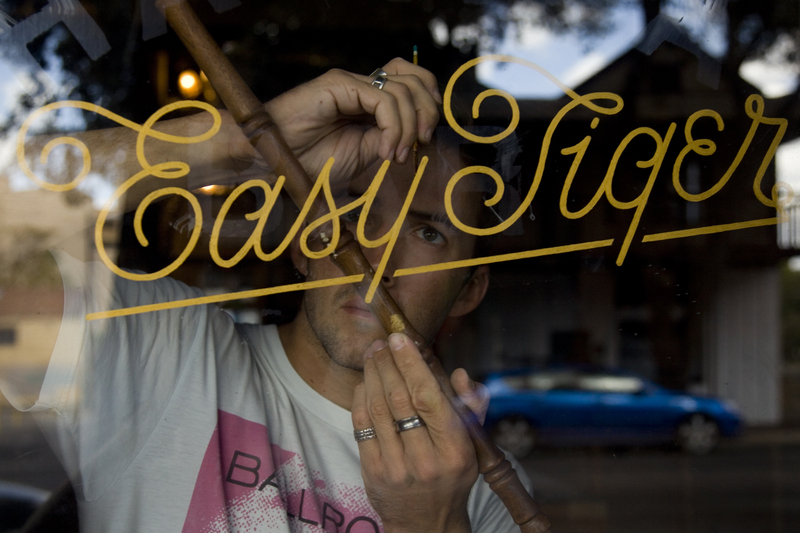 We got the idea from what sign makers used to do a long time ago before neon was available. There’s an old sign in the Cincinnati Sign Museum that uses this same method. I designed this with my friend Ryan. It’s a nod to the experience of working with friends. I began by coming up with the main design and we collaborated from there. It’s great to do jobs with friends, and It was exciting, not only because he’s my friend, but because we were so happy with the end result. We painted this van to look like a Bonneville race van— the kind that would follow behind a race car. I worked on the painting with a couple of friends who worked on the design. We painted it in this cool space that was kind of like a motorcycle shop. I get to see this van driving around town, and it’s always so satisfying to see it pass by. This one is actually in Venice Beach. It was a fun job because I got to travel; It was especially memorable because I proposed to my wife on that trip. The two of us painted this sign together. 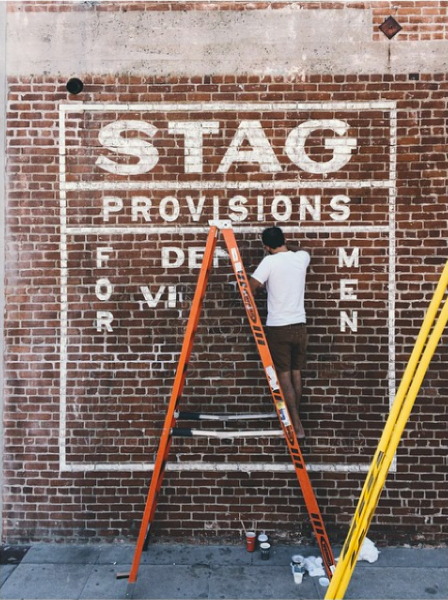 The whole project really kindled my desire to travel more for work— to become a traveling sign painter and muralist.